Never operate the saw above your chest. Reaching above your chest makes the saw hard to control. 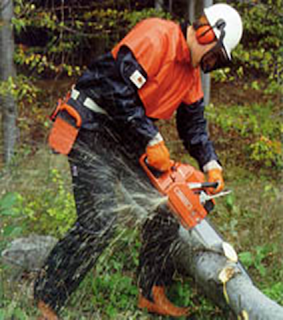 Operate the chain saw in a firm two-handed grip with fingers and thumb surrounding the handles. Keep both feet firmly positioned when operating a chain saw. Engage the chain brake before starting the chain saw. Shut off or chain brake engaged if terrain is hazardous or going more than 50 ft.